*No 'Love', 'Ban' or any other Last.fm nonsense. Works on your Mac running OS X 10.6 (Snow Leopard) or 10.7 (Lion). 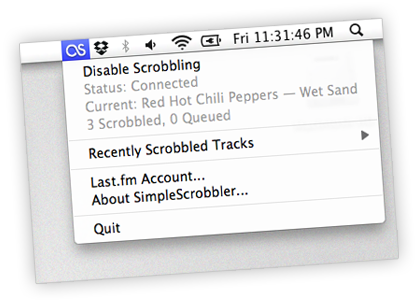 SimpleScrobbler has only one purpose: Scrobble your iTunes tracks. Scrobbles your iTunes tracks silently from the status bar. We won't bug you. Ever. Watches your iTunes playlist like a hawk. If you listened to it, we scrobbled it. It just works. Everytime. If you are offline, your scrobbles will be queued until they can be sent. Last.fm is a free music service that lets you discover new music you like, based on the music you already listen to. SimpleScrobbler™ • Copyright © 2008-2013 Urban Apps, LLC. All rights reserved.